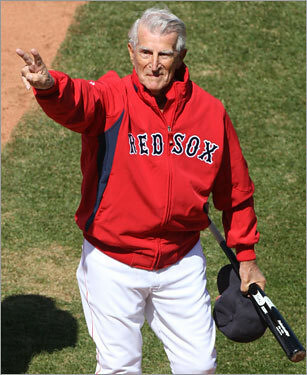 It was sad to hear the news that Johnny Pesky will now be playing on the 'Field of Dreams' somewhere. I met him a couple years back at the Old-Time Baseball game (that happened to take place last night). Everyone was pestering him for an autograph, yet I reluctantly decided to be one more mid-inning fan. With a program in hand, I said something like, "I'm sorry to bother you, Mr. Pesky, but could I get your autograph?" I'll never forget what he said to me: "Sure, but it won't buy you a cup of coffee..."
He was the great old guy with the humility and love of baseball that I expected from seeing him in the dugout on TV. I'm glad that he could stick around to get a world series ring and see his number retired. RIP, Johnny. At least you don't have to watch the rest of this season. FYI: There is cheapness through Saturday on the calendar. If you ever wanted to get humiliated at chess without paying for it (like at Washington Square Park), grandmaster Larry Christiansen is going to play up to 25 simultaneous games in the train concourse. Feel free to play or just sit back and brag to friends that you could've beat the guy. It's funny that there are open-air concerts in a park next to the airport. Jet engines will have to compete with the funky electro jams that will please those who can dance in the sun as well as the music-lovers that want to sit in the grass and wave their feet back and forth. On various occasions I've tried to come up with good ways to praise Lovewhip, but the simple fact is they're one of the most fun bands around. A couple of garage-rockers from Northern California are passing through on their way around the nation. The Wild Ones got a high compliment from one of their local radio stations who appropriately described them as "Shangri-Las meets The Ramones". Bummer City is shabby either. They are welcomed by the most excellent, skeleton-clad rumble of Darling Pet Munkee and retro-psych from Mmoss. It appears Ezra Furman has parted ways with the Harpoons, the band that backed him while he was a Tufts undergrad; and I recall hearing about their SXSW gig where Furman got some attention. The appeal has always been Furman's quirky storytelling over pleasant chords. Local indie-poppers The Hush Now wrap their tunes in a sunny, 'gazey haze. There should be another opener; who knows.